Four inches or a little longer. Top of head and throat black. Sides of head and neck white. White underside. Gray wings, back and tail. Inhabits forests, groves, and other wooded areas near ponds, marshes, and swamps and on farms and in towns throughout the southeastern U.S. from Kansas to New Jersey in the North to the Gulf States from Texas to Florida. Builds nests of fine grass, feathers and hair usually in abandon or natural cavities or excavates its own in older trees or bird houses from within reach up to fifteen feet. 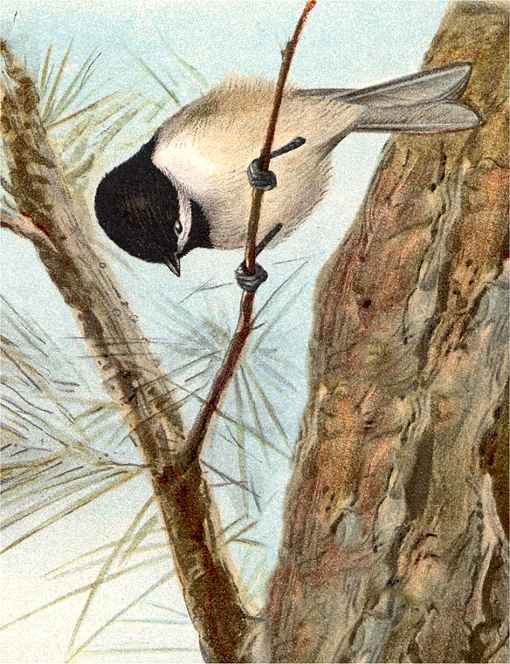 Forages for insects, their eggs and larva, seeds and fruit in small flocks with nuthatches and titmice and Black-capped Chickadees where their ranges overlap. Visits backyard feeders. Feed Chickadees sunflower seeds, nyger (thistle seeds), nuts and suet. Carolina Chickadees will nest in suitably sized and mounted birdhouses. The Carolina Chickadee birdhouse (same as for Titmice, Nuthatches, Downy Woodpecker and other Chickadees) has a 4″ by 4″ floor, 9″ inside ceiling, 1 1/4″ diameter entrance hole located 7″ above the floor and ventilation openings. More about this birdhouse. Assemble with corrosion resistant screws and fit to pre-drilled countersunk pilot holes. Secure hinge with shutter hooks for easy access. Mount nest box on a tree trunk or hang from a limb from chest level to just out of reach, higher if necessary. Place a few chips (not sawdust) on the nest box floor. Nuthatches, titmice, downy woodpeckers and other chickadees may use this nest box. Visits feeders and nests in bird houses. Feed Chickadees sunflower seeds, nyjer (thistle seeds) and suet.